Almost Tangent Structures and Tangent Bundles. Symplectic Manifolds and Cotangent Bundles. Presymplectic Mechanical Systems. Appendices: A Brief Summary of Particle Mechanics in Local Coordinates. Higher Order Tangent Bundles. Generalities. Bibliography. Index. 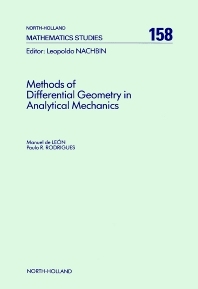 The differential geometric formulation of analytical mechanics not only offers a new insight into Mechanics, but also provides a more rigorous formulation of its physical content from a mathematical viewpoint. Topics covered in this volume include differential forms, the differential geometry of tangent and cotangent bundles, almost tangent geometry, symplectic and pre-symplectic Lagrangian and Hamiltonian formalisms, tensors and connections on manifolds, and geometrical aspects of variational and constraint theories. The book may be considered as a self-contained text and only presupposes that readers are acquainted with linear and multilinear algebra as well as advanced calculus.